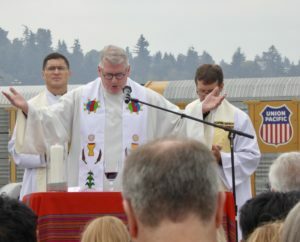 St. Joseph Parish in Seattle embarked on a journey almost a year ago that recently resulted in a prayer pilgrimage and Mass at the GEO run Northwest Detention Center in Tacoma Washington – a destination 30 minutes away by bus and light years away from where we come from as a faith community. 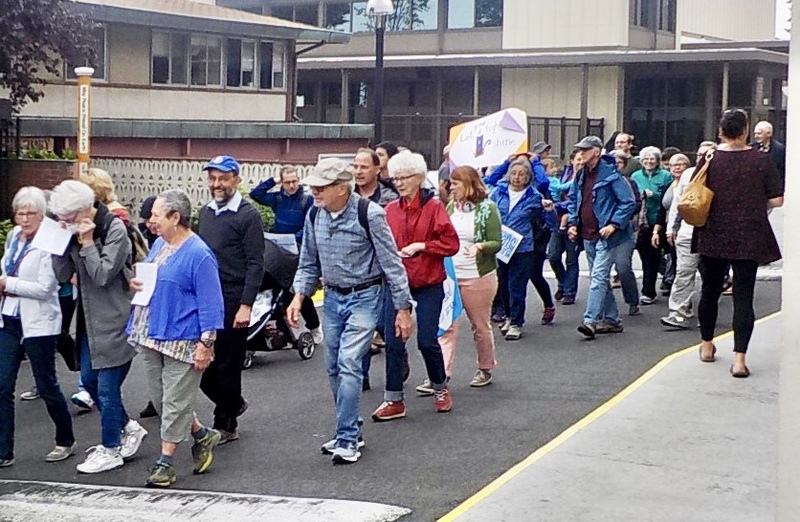 St. Joseph is a wealthy Jesuit parish in the Capitol Hill neighborhood of Seattle. The houses that surround the parish sell for millions of dollars. Very few of our members would be considered poor or marginalized and almost no one would be considered “illegal” or more correctly undocumented. And yet a year ago, our parish, known for its commitment to social justice, started a journey of education and solidarity with the immigrant, refugee, asylum seeker and those detained in Immigration Prison. After some preliminary research and assessment, we discerned that the greatest need, our interest and gifts as a faith community lie with public witness and advocacy. So beginning in March 2018 we published a Parish Letter, “A Church of Accompaniment,” that serves as our Mission Statement. From there we organized 2 community forums on Immigration and detention attended by over 300 people. In the second forum we were joined by our Congresswoman Pramila Jayapal, our representative who is a staunch advocate for immigrant justice. 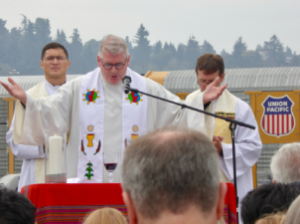 Now with growing parish support, we began planning with our Jesuit Sister Parish, St. Leo the Great, for a pilgrimage and Mass at the Northwest Detention Center in Tacoma. 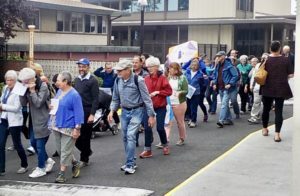 On August 25th we gathered at St. Leo’s and began our prayerful 1.6 mile walk to the detention center in a bleak industrial area near the Port of Tacoma. We were surprised and pleased that over 500 faithful people joined us. At the conclusion of the Mass we blessed the detainees and their captors. It was a hopeful day that renewed our energy for the continuing journey and cemented our relationship with immigrants and refugees. To learn more about St. Joseph Parish, visit their website here. This entry was posted in Front Page, Immigration, Mend the Gap, Spirit Filled Network on September 13, 2018 by networklobby.